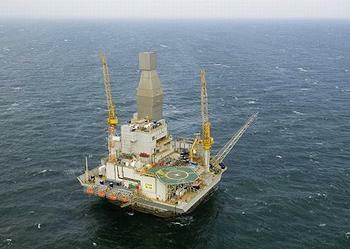 SOCHI, Russia, August 31, 2011 (ENS) – Russian state-owned oil company Rosneft and U.S. oil giant ExxonMobil have agreed to jointly undertake a US$3.2 billion oil and gas exploration program in the Black Sea and in the Kara Sea on the Arctic Ocean. The agreement signed Tuesday extends to joint exploration and development of hydrocarbon resources in Russia, the United States and other countries throughout the world, as well as the sharing of technology and expertise. The agreement was signed by Rosneft President Eduard Khudainatov and ExxonMobil Development Company President Neil Duffin in the presence of Russian Prime Minister Vladimir Putin in Sochi, the city on the Black Sea that is hosting Russia’s Olympic Games in 2014. Rex Tillerson, ExxonMobil chairman and chief executive officer, who attended the ceremony, said ExxonMobil will benefit Russian energy development by working closely with Rosneft. The initial $3.2 billion specified in the agreement is to be spent funding exploration of East Prinovozemelskiy Blocks 1, 2 and 3 in the Kara Sea and the Tuapse License Block in the Black Sea. The companies say these areas are among the most promising and least explored offshore areas globally, with high potential for liquids and gas. The Kara Sea license blocks have a total area of 126,000 square kilometers (30 million acres) in water ranging between 50 and 150 meters (165 feet and 500 feet) deep. Sea ice in the area is disappearing as a result of climate change, making exploration and drilling easier. Tuapse Block in the Black Sea is smaller in area and the resource occurs in deeper water, ranging from 1,000 to 2,000 meters (3,300 feet and 6,500 feet) below the surface. 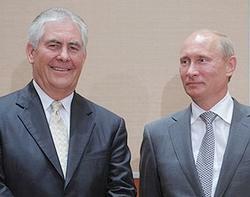 Rosneft equity interest in both joint ventures will be 66.7 percent, while ExxonMobil will hold 33.3 percent. The agreement provides Rosneft with an opportunity to gain equity interest in ExxonMobil exploration opportunities in North America, including deep-water Gulf of Mexico and tight oil fields in Texas, as well as additional opportunities in other countries. The companies have also agreed to conduct a joint study of developing tight oil resources in Western Siberia. Tight oil reservoirs are oil pools where hydraulic fracturing, or fracking, and horizontal wells are required to extract the resources. Fracking involves drilling into tight rock, setting off explosives to crack the rock, then injecting water and chemicals to release natural gas and oil. Environmentalists are concerned because the process pollutes air and groundwater. Under the agreement, the two companies will create an Arctic Research and Design Center for Offshore Developments in St. Petersburg, which will be staffed by Rosneft and ExxonMobil employees. The St. Petersburg center will use proprietary ExxonMobil and Rosneft technology and also will develop new technology to support the joint Arctic projects, including drilling, production and ice-class drilling platforms. “This venture comes as a result of many years of cooperation with ExxonMobil and brings Rosneft into large scale world-class projects, turning the company into a global energy leader,” he said.